It's been a busy week this week with the inaugural 4 by 4 event, 2nd Team matches and the Winchester House challenge. Firstly the 4 by 4. No this is not driving round looking for a squash court in your landrover, but a new concept in squash designed to re-invigorate team squash and draw more members into playing team squash. The concept is simple take two teams of 4 people and play 3 games each against the person ranked the same in the opposite team. So 4v4, 3v3, 2v2 and 1v1. The winner is the team with the most number of points from all of the games added up, so every point counts win or lose. This was a test of the event and we had 2 ladies and 2 mens teams playing. Brackley Ladies put up a good show but lost to a very strong Lings/Bucks team, Brackley/Lings men won (just) against the Corby team. The event is being written up as a case study and presented to England squash, with Brackley Squash Club playing a big part. We timed all the games and are looking at the best scoring system to make this work. The whole thing took 2 hours which for 8 games on 2 courts was a good showing. In future we will run more of these events and hope to broaden out the competitors with a wider range of abilities. Despite the soft focus picture this was a well fought event. 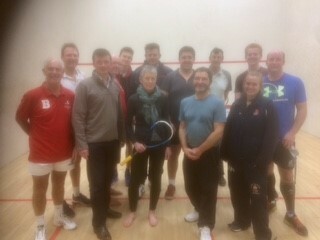 8 staff from Winchester House played 7 players from Brackley (would have been 8 but Simon H cried off with man flu!). We played 3 games each with the total points counting. Some great matches with a narrow win for Brackley by 13 points. Nothing was certain until the last match was played. It was good to see some none team members play. We were kindly treated to drinks in the Library at Winchester House afterwards and then off for the obligatory curry. Now Winchester House have got the bit between their teeth they will be practicing hard ready for the rematch.